In contrast, building a new dam at Temperance Flat would require a capital investment of $3.4 billion and provide only 158,000 acre-feet per year; the cost of this water would be $720 per acre-foot, and cost estimates are rising. Unlike such proposed new water storage projects, urban and agricultural efficiency improvements often pay for themselves as a result of the many co-benefits that water conservation and efficiency provide, including reductions in wastewater and energy bills and improvements in crop quality and yield – and they can be implemented immediately. Early this year, Pacific Institute President Peter Gleick testified before the U.S. House of Representatives Subcommittee on Water and Power that “improving the efficiency of our water use is the cheapest, easiest, fastest, and least destructive way to meet California’s current and future water supply needs.” Previous Pacific Institute reports on urban and agricultural water efficiency provide a comprehensive statewide analysis that finds that existing, cost-effective technologies and policies can reduce current state demand for water by 6-8 million acre-feet, or around 20 percent. What do the water conservation and efficiency measures in the California’s Next Million Acre-Feet report look like? A million acre-feet is nearly 12 times the city of San Francisco’s annual water use and almost three times the amount of water that would be yielded annually by the proposed Sites Reservoir and Temperance Flat Reservoir combined. It would take 18 water desalination plants the size of the proposed Carlsbad plant (which would be the largest in the northern hemisphere) to produce a million acre-feet a year. 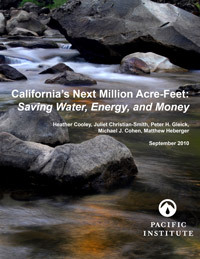 The Pacific Institute’s analysis strongly recommends that water conservation and efficiency be a central component of any portfolio of solutions for California’s water problems, and it offers specific strategies to help finance and implement them. Such strategies include financial incentives and rebates for water users, water pricing policies, metering, setting of targets, and education.